We offer a nationwide Port Agency service to ship owners on a contractual basis and by inducement. 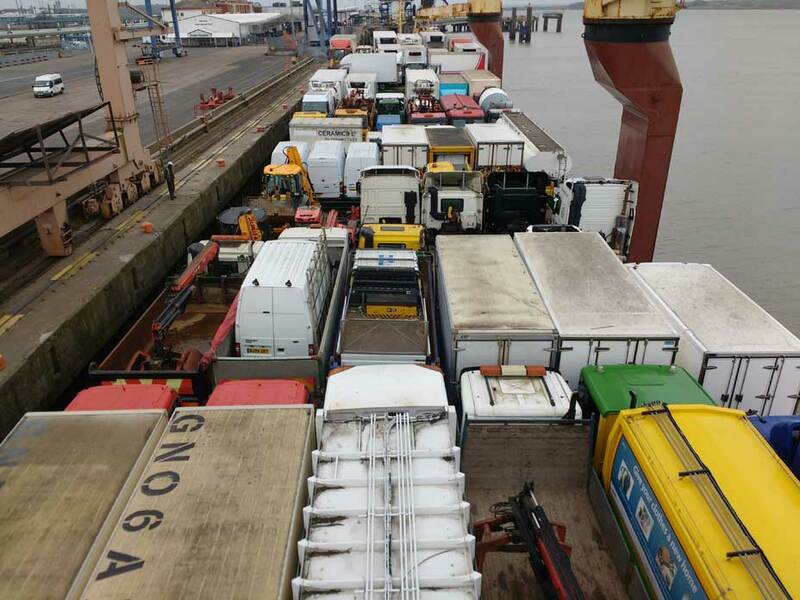 Based in Felixstowe, we are ideally located to provide Port Agency services at Felixstowe, Harwich, Ipswich, Lowestoft, Great Yarmouth, Tilbury, Thamesport and Sheerness. Our experienced and qualified staff (including ex-seafarers) are able to arrange berthing, pilotage, tugs, unloading and loading, stevedoring, bunkering and payment of Light Dues and disbursements. We take care of all documentary requirements including; vessel clearance on arrival and departure; liaising with Harbour Authorities, Port Authorities, HMRC and the Border Agency; issuing Manifests, Bills of Lading and Light Dues Certificates. We can arrange delivery of stores, facilitate any repairs required (through our network of competent and trusted suppliers) and take care of all your crews' needs while in port. With greater emphasis placed on electronic arrival and departure declarations for vessels in the UK, our investment in port community systems and direct computer links to the major UK ports puts us ahead of our competitors. In summary, full agency / husbandry or protecting agency services are available. Specialist services are also available for the ‘off-shore’ and ‘renewables’ markets, which require a different touch. Overall, our aim is to alleviate the burden on the Master and crew while a vessel is in port and ensure a quick vessel turnaround. We have especially close links with a number of Danish and German owners. 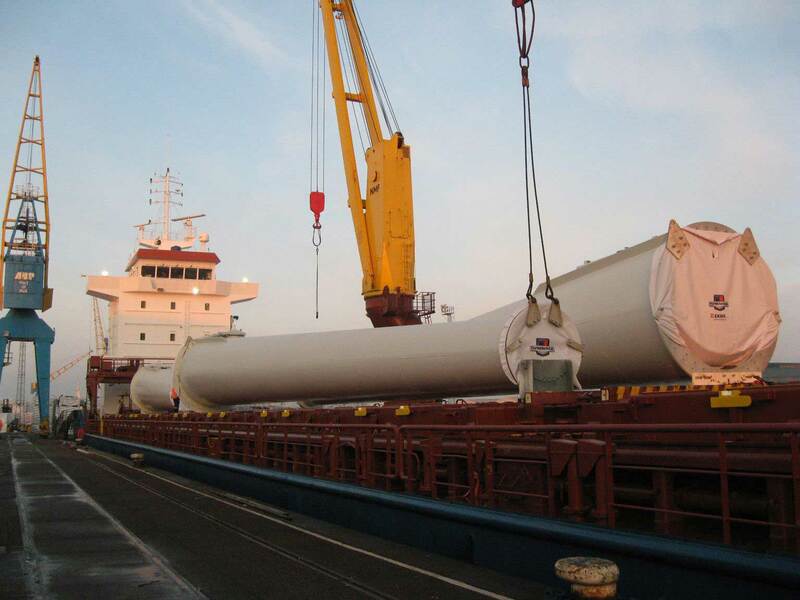 They operate both geared and un-geared vessels in the 2000 - 8000 DWT range on a worldwide basis. 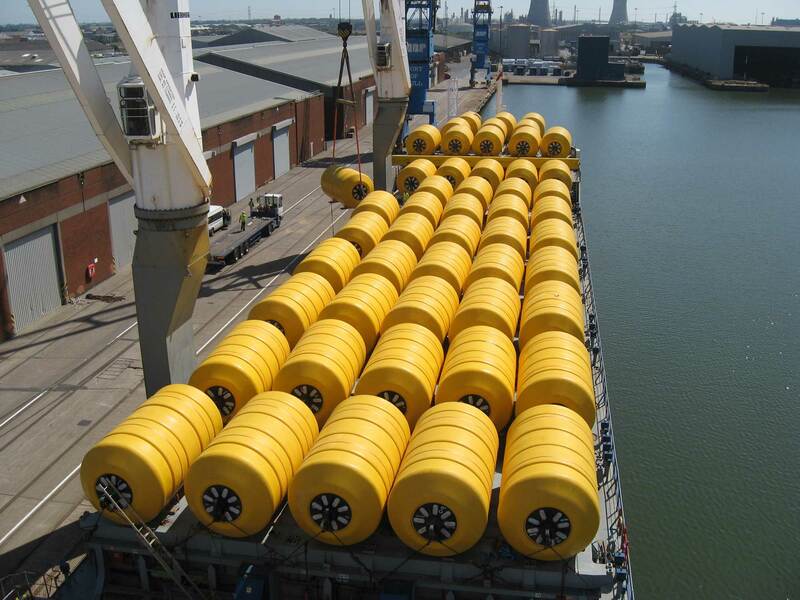 These vessels can be used for the transport of project and special cargo movements requiring heavy lifts, segregation as well as containerised and bulk, bagged and general cargoes. We are company members of the Institute of Chartered Shipbrokers , FONASBA Quality Standard Approved and have close links with ECASBA , all of which keep us at the forefront of all agency matters on a global scale. M/V Thorco Angela lifting a luxury yacht from water at Harwich International Port, July 2018. M/V Henrik S heavy lift at Harwich International Port, April 2018. M/V Hannah S at Harwich International Port, March 2018. Loading an excavator to the M/V Hannah S at Harwich International Port, March 2018. M/V Henrik S at Harwich International Port, November 2017. Loading excavators to the M/V Henrik S at Harwich International Port, November 2017. 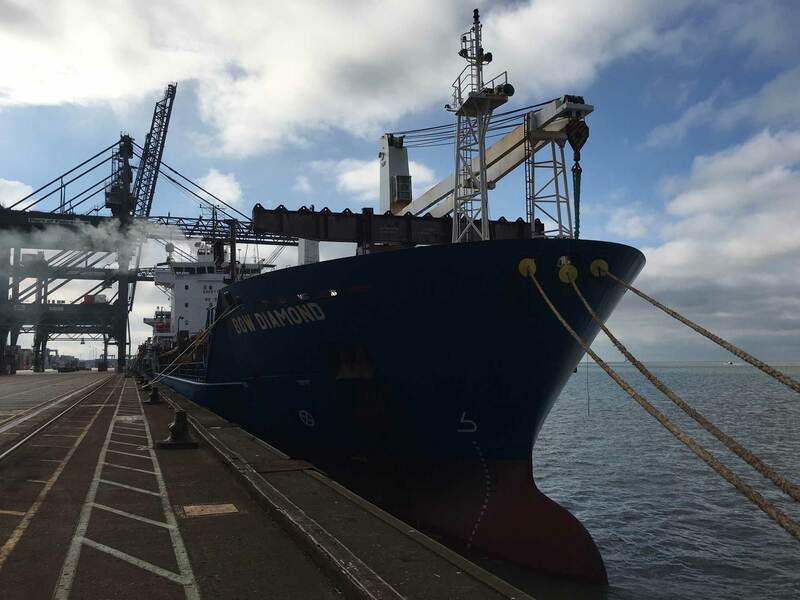 M/V Bow Diamond at the Port of Felixstowe, August 2017. M/V Normed Antwerpen at Harwich International Port, January 2017. 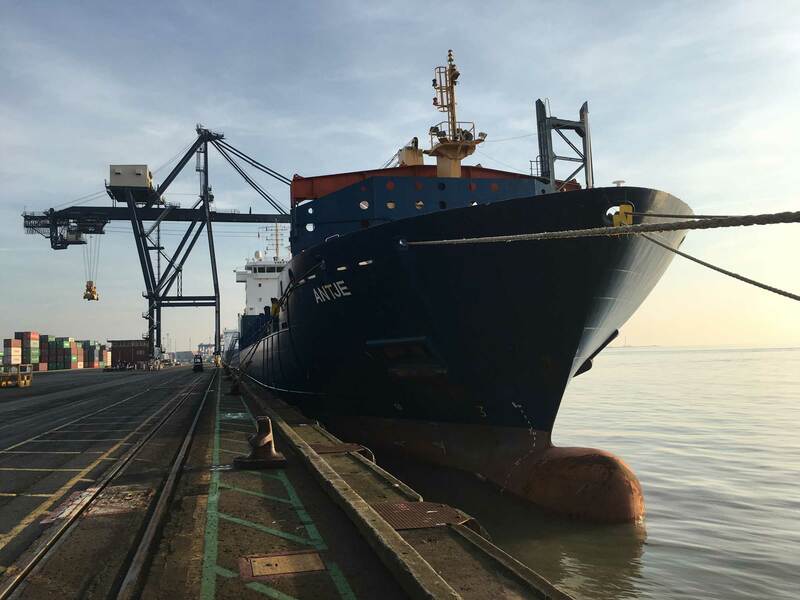 M/V Antje at the Port of Felixstowe, December 2016. Loading to the M/V Norjan, October 2016. M/V Nomadic Bergen loading vehicles bound for Cyprus at Harwich International Port, March 2016. Grange Shipping were nominated agents for the M/V Atlantic Dawn when she called at Southampton in February 2015. 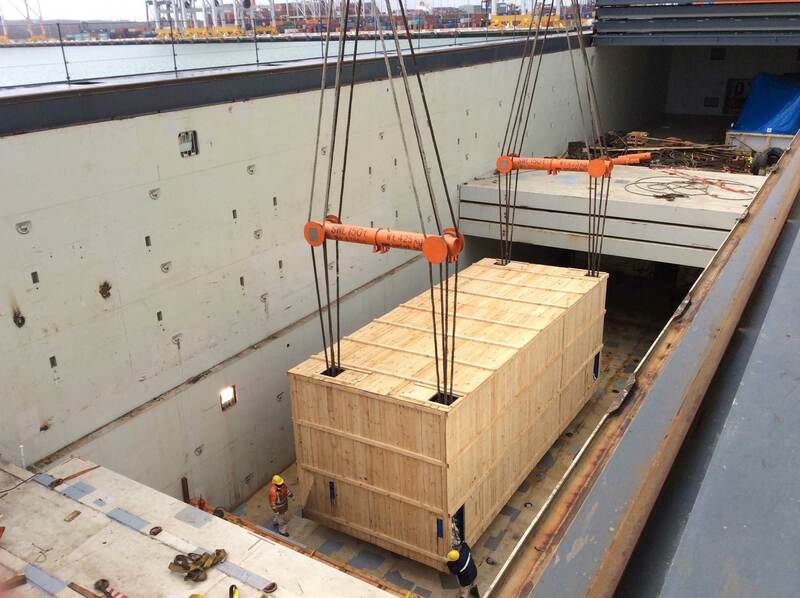 M/V Atlantic Dawn loading a 65 tonne water injection pump at Southampton, February 2015. M/V Lifter, January 2015. Discharging wind turbine towers at Hull. M.V. Lifter, February 2014. Loading luxury motor yachts bound for the Mediterranean Sea. M.V. Norjan, July 2013. Loading specialist subsea buoyancy devices at Hull. M.V. Sudkap, October 2012. Unloading a locomotive at Newport.